Unique injectable matrix combining the activity of an osteostimulative carrier with longer term support of porous micro-scaffolds. 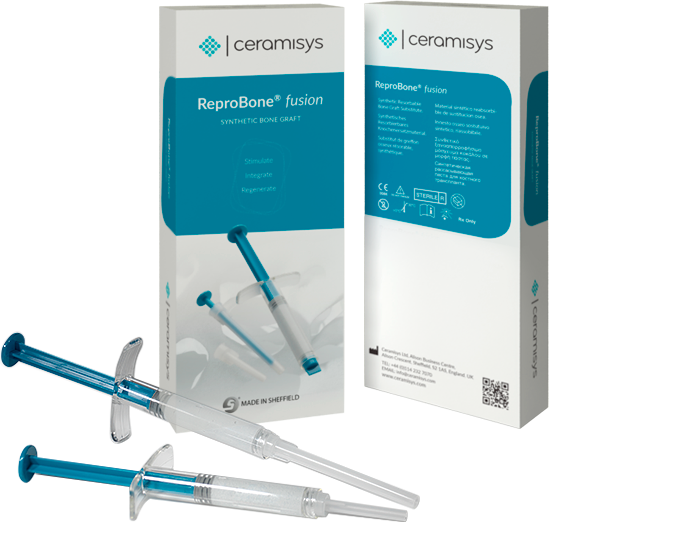 ReproBone® fusion is indicated for use as a bone graft substitute for the repair of non-load bearing aseptic osseous defects and for the filling of spinal cages. Its mouldable and firm texture is especially suitable for the filling of bone defects that require longer term support and volume stability. Volume stable viscosity allows easy and accurate application of the granulated paste. Excellent contact with the viable bone surface maximises the bone implant interface. The sticky non-setting formula supports bone regeneration by encouraging rapid cell ingrowth throughout the healing process. Prepacked in the syringe, the paste is easy to inject with no pre-mixing or preparation required. Simply remove the cap and apply directly into the defect. Optional cannulas are provided. ReproBone® fusion can also be mixed with bone marrow aspirate and/or autologous bone prior to application. An enhanced activity profile from the unique multiphase composition of nano, micro and macro structured material supports and encourages formation of new bone whilst maintaining volume. Such volume stability is particularly suitable for spinal surgery. The highly active matrix attracts and adsorbs biomolecules onto the surface to create an optimal microenvironment that promotes new bone formation. Over time the material is gradually replaced by mature bone.